Brian K. Cooley, MD participates in most major insurance plans. * Please check with your insurance company to verify benefits, and determine your co-pay amount prior to scheduled appointment. If you have any questions regarding your insurance, please call us at (972) 758-5484. *List of accepted insurance plans is subject to change. 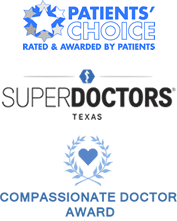 Please confirm acceptance and benefits with your insurance provider or by calling our office at (972) 758-5484 prior to scheduled appointment.